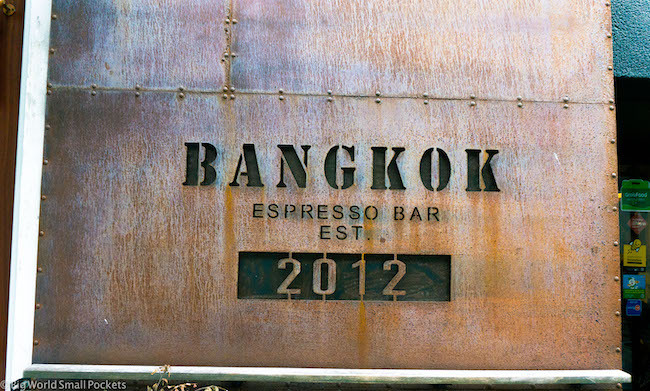 Fast-paced, fiery and furious, brash Bangkok isn’t everyone’s cup of tea! 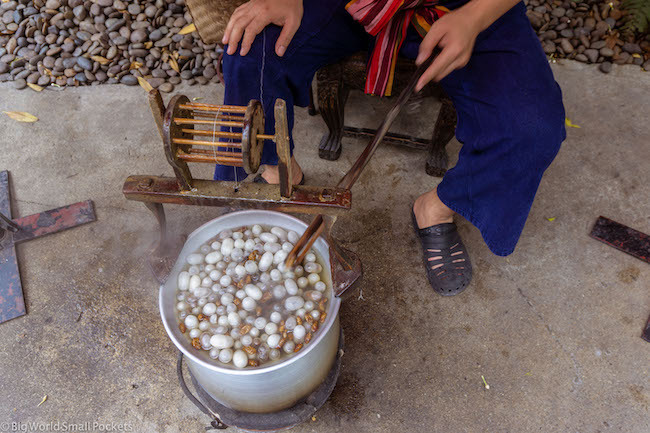 Landing here, to take in your first experience of Southeast Asia like many people do, can be something of a baptism of fire. But hang in there, because despite its rough exterior, Bangkok is unapologetically real and unremorsefully brazen – a city that won’t allow itself to be judged and won’t judge in return. And once you accept this fact, and take everything as it is, without comment or question, Bangkok’s confronting style gets right under your skin. As does it’s pollution! Ha! 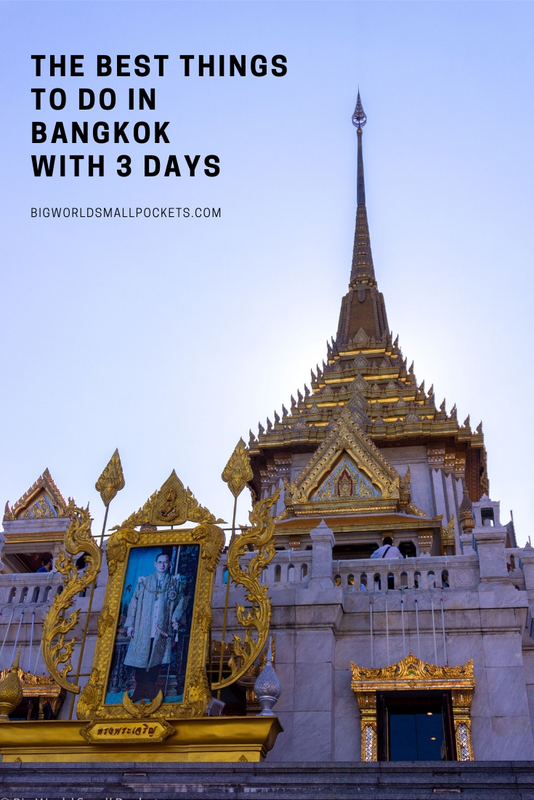 So here it is people, the best things to do in Bangkok in 3 days. My stay at the Mercure Bangkok Sukhumvit 11 and tour with TakeMeTour were kindly sponsored, but, as always, all views are my own. Let’s call day 1 in Bangkok temple day, or tourist day, whichever you prefer (ha!) 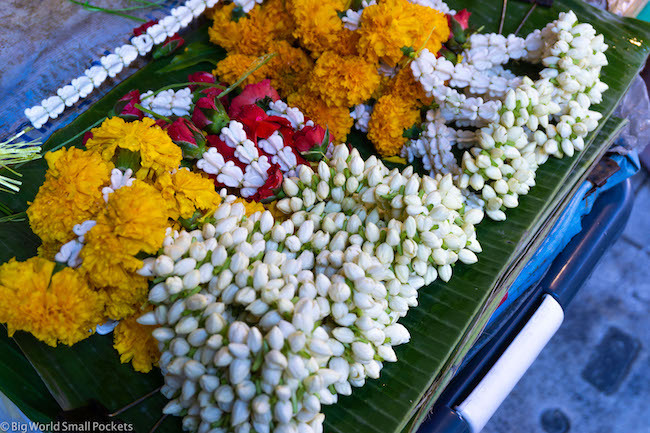 because this is the day to tick off all those amazing religious and spiritual sights in Bangkok. Start your day early to avoid the heat and the crowds (before the tour bus herds arrive) and to ensure you can cram in as much of the following as possible! And on that motivating note, I suggest you begin at Wat Mahathat, one of the oldest temples in the city and an important site of monastic study even today. Next door is Bangkok’s largest amulet market. Held every Sunday, it’s worth checking out if you have time. 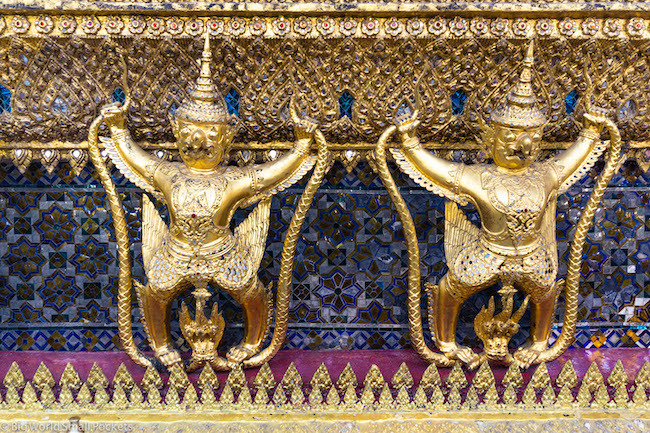 After that, continue south onto the biggest complex of your temple day – The Grand Palace. This spot also has the biggest price tag to match at 500 THB, but really is quite spectacular. 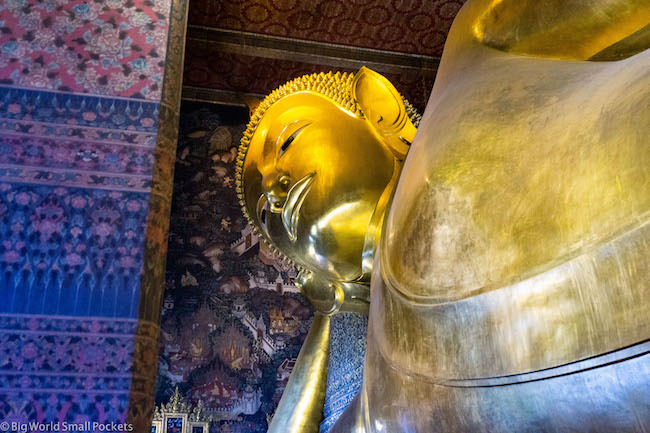 Despite the tourist numbers, you can easily pass a few hours in this huge site, which includes the famous Temple of the Emerald Buddha – the most sacred temple in Thailand. After this, stroll out to snap the icon Giant Swing, built in 1784, before hitting up another classic temple landmark in Bangkok – that of Wat Pho (entrance 200 THB) to see the giant reclining Buddha, and when I say giant, I mean giant! Next, it’s time to head directly across the river to see my favourite temple of them all – Wat Arun (entrance 50 THB) – before taking a river taxi down the water to China Town. 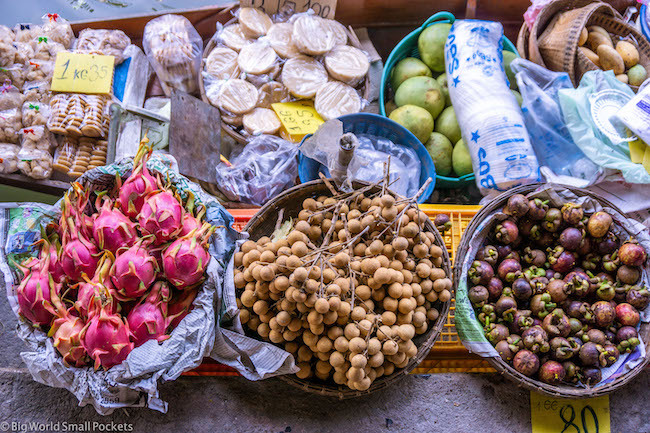 Spend the rest of the afternoon exploring the historic markets on foot in this part of Bangkok, as well as one last temple (in the form of the Golden Buddha Temple, 40 THB entrance) if you can stomach anymore! 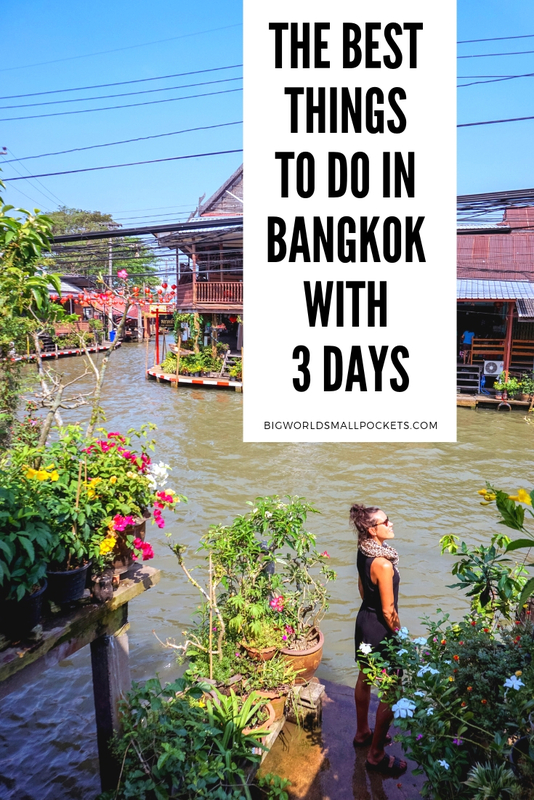 Finish your day with sunset from the Golden Mountain Temple or alternatively hit the Khao San Road, if you truly want to see the worst of what Bangkok has to offer! 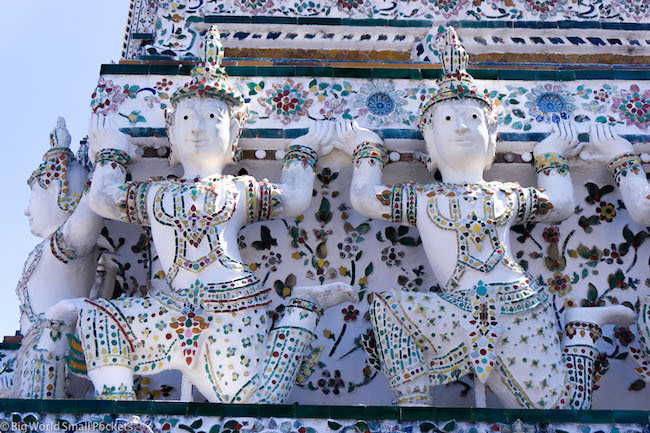 TOP TIP: Rules for visiting the temples include both males and females having their shoulders and knees covered but, despite what many guidebooks say, flip flops / sandals are ok, as are long shorts that come to the knee and T-shirts that cover shoulders but not the whole arm. WANT A GREAT PLACE TO STAY IN BANGKOK? As opposed to staying on or near the Khao San Road, which is honestly one of the worst places I’ve ever had the pleasure of spending a full 3 minutes before I turned on my heels and fled, can I suggest you stay in the Sukhumvit area of Bangkok instead. Very tourist-friendly with excellent transport links across the city, this place is full of great restaurants, bars, cafés, malls, massages, amenities and services. Having stayed there myself as a solo female, I can definitely say I felt a lot safer there walking around at night by myself than anywhere else, and there’s an excellent choice of accommodation in this bustling part of the city too. And when it comes to my recommendations, especially if you want to treat yourself, then look no further than the Mercure Bangkok Sukhumvit 11. Ideally located, with huge, clean and comfortable rooms (some of which include a bath!) and some of the most helpful staff I’ve ever encountered, this place is an absolute haven amongst the hustle and bustle of Bangkok. 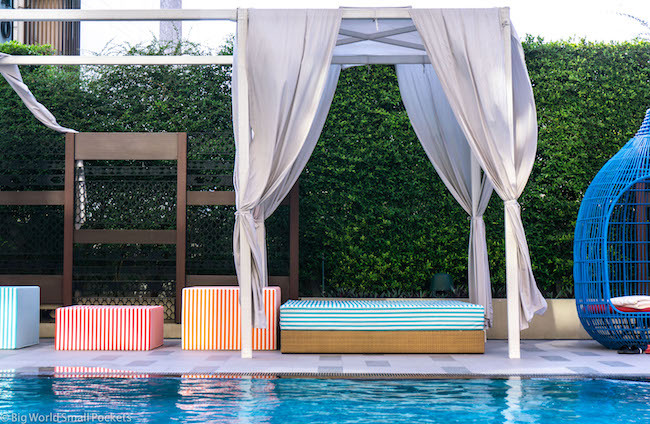 The gorgeous pool and daybeds are a dream when you need to relax away from the sweat and urban chaos of the city, and the bar and several restaurants onsite here will make your stay easy, convenient and stress-free. 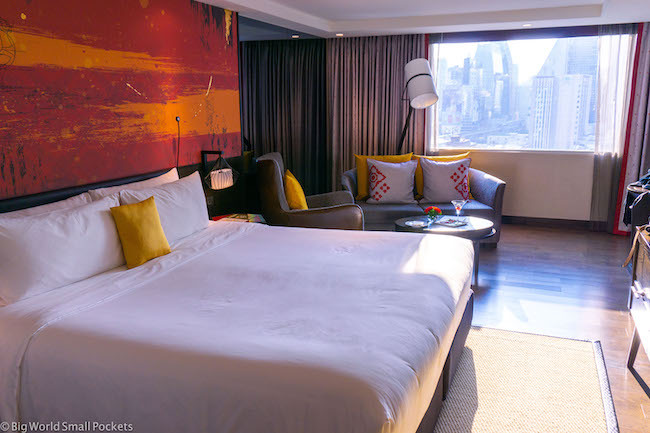 Honestly, I absolutely loved my stay here and would return in an instant, which is why I can’t recommend the Mercure Bangkok Sukhumvit 11 enough if you’re looking to enjoy this city in chilled style! And if you are staying at the Mercure Bangkok Sukhumvit 11, day 2 of the best things to do in Bangkok is going to be perfect for you, because it’s based around being able to move easily via the BTS Skytrain & MRT Subway, access to which is just a short walk away from this hotel. Start your day by heading to the Ari stop on the BTS Sukhumvit Line for your morning coffee. The burgeoning hipster area of the city, there’ s tons of funky cafes and fun food stalls around here to sample. My favourite has to be LaLiart, which is open daily from 9am until 6:30pm. After Ari, catch the BTS Sukhumvit Line to Ratchathewi station, from where you can easily walk to the historic Jim Thompson House Museum. The former residence of entrepreneurial American, Jim Thompson, a wealthy silk merchant who lived and built his empire business from Bangkok, this is a great heritage attraction. Tours of his home run every 20 minutes and cost 150 THB. After this, jump back on the BTS Sukhumvit Line to Siam station and then change onto the MRT Subway and ride to Si Lom station. 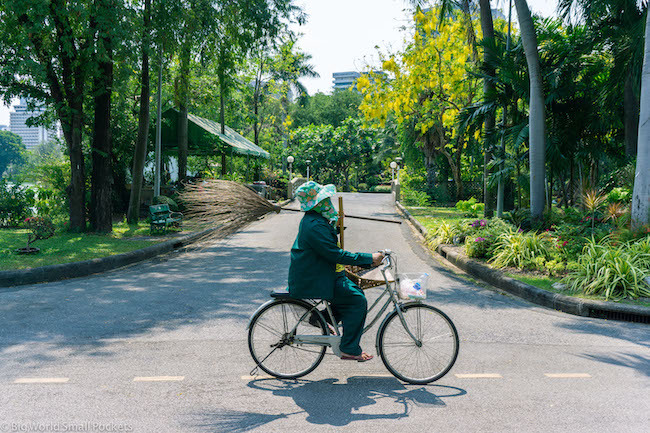 From here, get out to stroll, relax, pedalo, cycle and enjoy the great wonder that is Lumphini Park, one of Bangkok’s most welcoming green spaces for the afternoon. On the way back take an iconic tuk-tuk ride (no time in Bangkok would be complete without one!) and hit the malls for some good shopping and eating options. #1 Lonely Planet Guidebook – The Bangkok Lonely Planet is excellent and very helpful for any trip to this city with lots of top tips and good practical information. #2 Walking Shoes – There’s likely to be a lot of walking in Bangkok especially as the traffic here can be so bad. As such, I advise packing a pair of good runners, like these New Balance trainers, which are perfect for city strolling. #3 European & British Power Adapters – Bangkok has a mix of power outlets, but generally opts for a combination of the European and British ones, so make sure you come prepared with a Skross world adapter. #4 Camera and Lens – I love my Sony A6000 mirrorless, which was ideal for capturing this crazy capital at its best. #5 Travel Scarf – A great multi-purpose travel item that can be used to safely store valuables and cover your shoulders while you explore Bangkok’s temples. 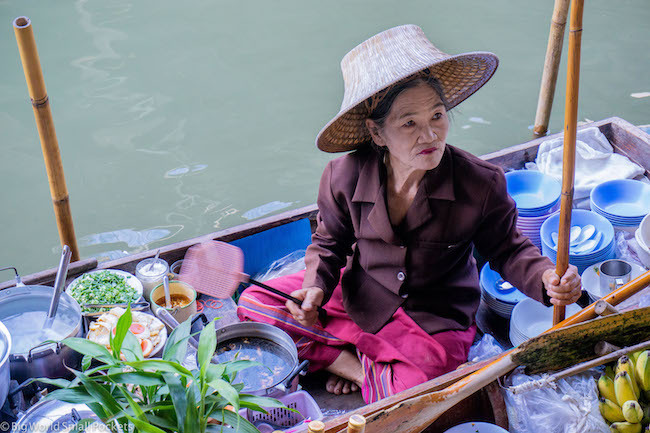 #6 Good Travel Insurance – I wouldn’t dream of travelling anywhere in Southeast Asia without coverage and highly recommend travel insurance from World Nomads, which I’ve used during my time in Thailand and beyond. 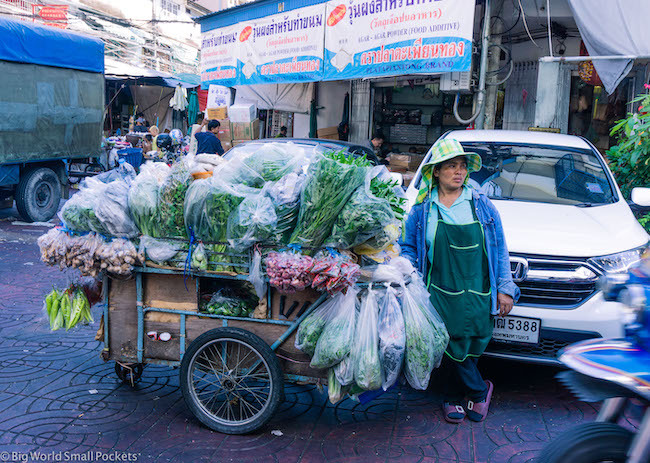 On day 3 of this itinerary of the best things to do in Bangkok, it’s time to get out of the city to enjoy some of the great market and local life around. Highly recommended are one the many tours offered by TakeMeTour, who specialise in local market, temples, cycling and cooking trips within and around Bangkok. Essentially operating as a huge independent marketplace, this great online resource connects local tour providers with tourists in a safe, sophisticated and professional way. With a huge range of tours on offer, each making its itinerary clear, catering for dietary requirements and setting a fair price, this is a great forum for providing value and security for travellers, whilst also helping local independent operators. 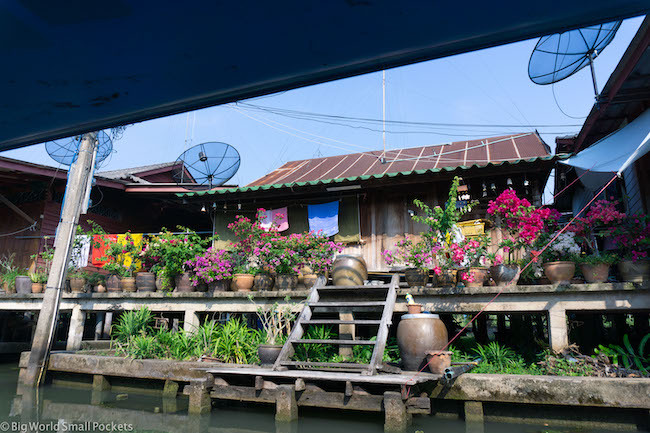 My tour to see the beautiful Bangkok floating markets and Maeklong Railway Market with TakeMeTour was absolutely brilliant, with my fabulous guide (who spoke English perfectly and couldn’t do enough to help me) imparting tons of information that I never would have been able to learn otherwise. I was picked up for the tour early from outside the Mercure Bangkok Sukhumvit 11 and dropped back there in the afternoon, which made the whole experience incredibly stress-free and easy – just what jetlagged me needed! The tour also included lunch at a traditional restaurant, as well as some great photo opps and the chance to enjoy a real sense of local life – honestly, it was brilliant! Then, after 3 busy days seeing all the best things to do in Bangkok, it’s time to relax, and what better way than with an amazing Thai massage. Personally, I highly recommend Healthlands Resort and Spa. Situated right near the BTS Asok station in Sukhumvit, the 2 hour incredible traditional massage I received here cost just 600 THB and is, without question, one of the best things I’ve ever spent money on in my travel career! And if you can possible wrangle 4 days for your Bangkok itinerary, then I highly recommend booking a TakeMeTour to the former capital and nearby city of Ayutthaya. Dating back to 1350, a UNESCO World Heritage Site and just 80km from Bangkok, a day trip to Ayutthaya is a must see if you like history, photography and impressive temples … or all of the above! 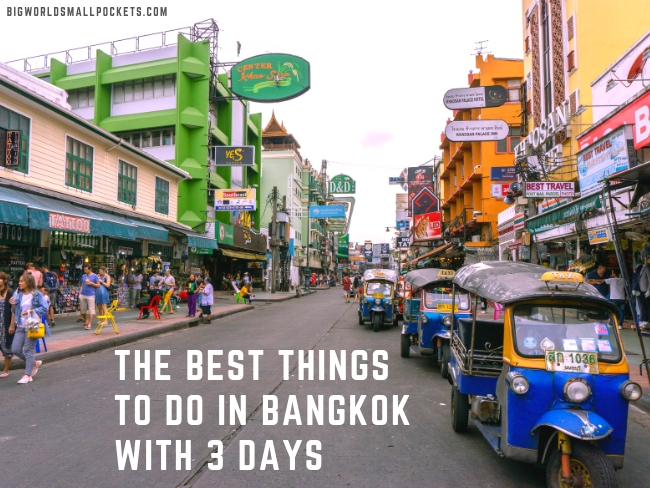 And there you have it, my complete guide to the best things to do in Bangkok in 3 days. Have you visited the Thai capital? What was your favourite thing to do in this city?